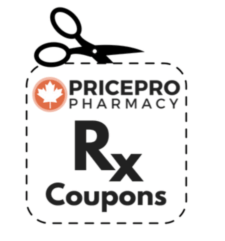 Take advantage of this Dexilant coupon, available only at our Canadian Pharmacy Online! Coupon is applicable on your first order over $50 and coupon codes cannot be combined. One-time use only. 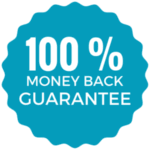 If you're familiar with this drug and would like to skip to the Dexilant coupon, simply add the DEX10 at checkout and you'll see the discount deducted right away. Otherwise, keep reading to learn more about this medication. 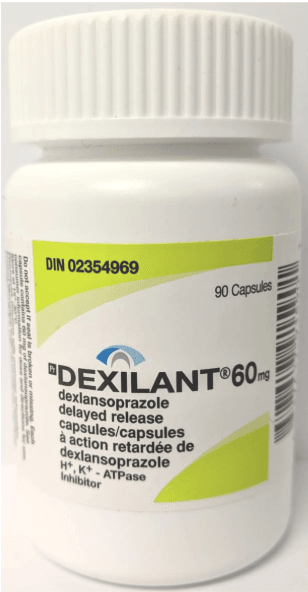 Dexilant, which is classified as a proton pump inhibitor, or PPI, is used to treat erosive esophagitis and acid reflux by reducing your stomach’s acid production. It can be especially helpful for people suffering for GERD, or gastroesophageal reflux disease, by preventing stomach acid from reaching the throat and causing heartburn and discomfort. It is available in both 30mg and 60mg capsules which are manufactured by Takeda. When prescribed, Dexilant is taken once by mouth per day for up to 4-8 weeks, depending on your condition. For erosive esophagitis, your treatment plan may include a 60 mg capsule for up to 8 weeks, followed by 30 mg once a day during the healing period. Those suffering from GERD may only need a 30mg capsule for 4 weeks to find relief. It’s important to follow your doctor’s instructions instead of these examples listed. In addition, Dexilant can be taken with food or without, depending on your preference. If you happen to miss a dose, take your next one right away. However, you should not take two doses at once. So if your missed dose coincides with your next one, take only one dose at a time and wait to administer the second one. Dexilant should also be swallowed instead of chewed. If this is difficult for you, you can open your Dexilant capsule and pour this over applesauce and consume immediately to take your next dose. If you’re unable to finish this mixture, throw out any leftovers instead of trying to save it for later. In the event that you believe you have overdosed on Dexilant please contact poison control or go to an emergency room immediately. Dexilant is prescribed to those who are 18 and over and should not be taken if you are under 18. Before taking Dexilant let your doctor know if you have a history of liver disease or are currently pregnant or breastfeeding or plan to be pregnant and/or breastfeeding in the near future. Let your doctor know if you are using any products that contain ketoconazole, methotrexate, tacrolimus or iron. When taking Dexilant there are a few precautions to be aware of. If you are taking several doses of Dexilant daily for more than a year, you may experience wrist, hip and spine fractures as well as low magnesium levels. When 4,500 adults were studied after taking Dexilant, roughly 3-5% experienced side effects such as diarrhea -- which was the most common symptom. Other symptoms included, stomach pain, nausea, vomiting, and gas. And about 3%, or less than 135 people, of the total number of patients also had common cold symptoms. With these figures, Dexilant is considered to have a low occurrence of side effects. However, if you begin to experience serious side effects such as seizures, irregular heartbeats, muscle cramps, jerky muscle movement, confusion and dizziness, please contact your doctor immediately. Your doctor should also know if you are breastfeeding, pregnant, or plan to become pregnant and breastfeed. Dexilant may interact with other medications so it’s also important to discuss this with your doctor beforehand. Even over-the-counter and herbal medicines and vitamins can be reactive and should be brought up with your doctor before taking Dexilant. If you are undergoing any medical tests, reach out to your doctor and laboratory technician and let them know that you are taking Dexilant as it can directly affect your tests results and cause them to be false. When taking Dexilant, do not use any medications containing lansoprazole (Prevacid) as the two are very similar. You should also stay away from methotrexate (Trexall) as this substance has the potential to interact with Dexilant. Once your doctor gives you the all-clear that it’s safe to use this prescription, you can use a Dexilant coupon to save money on your first refill. Before you drop off your Dexilant prescription to your local pharmacy, consider the drastic price difference between what you would pay in the States versus what you could be paying online for the same high-quality medication. In the United States, a 30mg prescription of Dexilant will run you about $303.39 for a 30-day supply. On the other hand, through our online pharmacy, you would pay $247.00 for 90 days worth of that same strength. So your three-month supply would be less than what one month would cost you locally. And that’s before a Dexilant coupon is even applied. Plus, you won’t have to sacrifice on quality or safety by going with our cost-effective pharmacy since we use the same Dexilant that’s manufactured by Takeda Pharmaceutical, which is what your local pharmacy most likely dispenses. 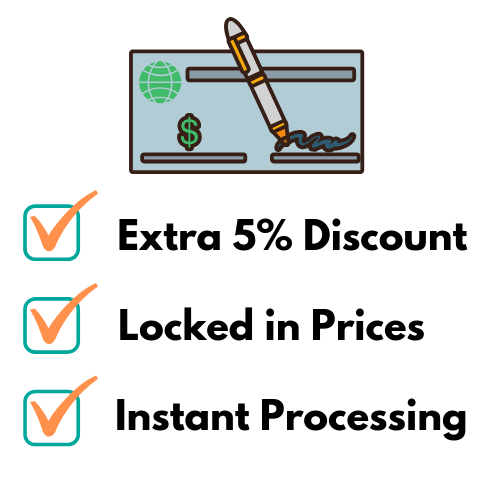 On top of that, if this is your first time shopping with us, you can also apply a Dexilant coupon to instantly save $10.00 on your first order. Simply add the code DEX10 at checkout and you’ll see the discount deducted right away. To get started today, scroll up to the top of this page and click the ‘Check Prices’ blue button next to the dosage your doctor prescribed. Continue to checkout, apply the discount, and you’ll be on your way to cutting your monthly Dexilant cost to a third of what you would pay in the States. If you’d like to learn more about this medication before making your first purchase, click on the ‘+’ next to any one of the blue boxes below. 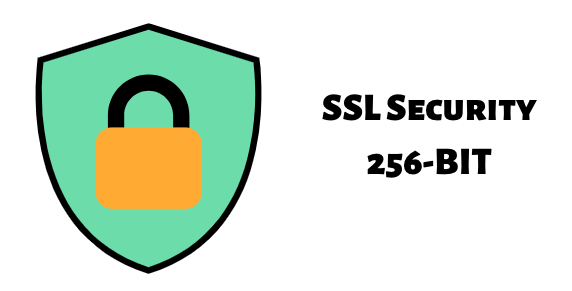 For more information on how our prices are so low, visit this resource.